The Voter Integrity Project of NC was founded in 2011 by Jay DeLancy and John Pizzo. Their mission was to ensure free and fair elections to all lawfully registered voters. Mr. Pizzo has more than 30 years private industry experience in the discipline of of quality engineering and holds a Six Sigma Black Belt. Mr. DeLancy is a retired Air Force Lieutenant Colonel, with military experience in both conventional and nuclear operations with advanced degree work in journalism, business and political communication. His past teaching assignments include numerous community colleges, Park University, Bluefield College, Liberty University, NC State University and a temporary position at Duke. The VIP plan was simple: Mine public data, analyze that data and let the evidence speak for itself. They fashioned themselves as a “non-partisan” organization, because election laws (like the Constitution itself) should transcend political and cultural boundaries. Open and honest elections are in our nation’s best interest. Starting with a “voter density” study of North Carolina’s 100 counties, they began publishing their research results on-line and sharing it with media, lawmakers and with peers from other states. Their second project copied the ground-breaking work of the Miami Herald, who obtained the names and addresses of persons disqualified from jury duty because of their non-US citizen status. This VIP effort led to the discovery of 130 people who had voted before they were disqualified from jury duty, 11 of whom became targets of criminal referrals. This research has led to legislative attempts in 2013, 2015 and 2017 to require Clerks of Court to share their data with elections officials. Their third project, garnering national exposure, led to the discovery of almost 30,000 deceased persons who were still registered to vote, some of whom had voting records beyond their date of death. This research identified numerous “data leakage” points in the deceased-voter removal process. It also triggered consultations with election officials that resulted in process improvements for identification and removal of deceased-voters’ records. The fourth major project involved detecting persons who voted in more than one state during the same Federal election. By matching 11 million Florida voters with the 77 million NC voters, VIP ultimately reported more than 150 voters who were highly likely to have committed this felony. Investigations are ongoing, but the work triggered five initial criminal referrals. As of January 2018, this project has spawned three felony convictions (for details, please click here and here) and numerous consultations with senior election officials in other states. This project (called “FLANC,” as in Florida and NC) also resulted in the first VIP publication that is being sold to the public through Amazon’s marketplace. Other major research projects are currently underway that all point to identifying areas of election law that need process improvement and prevention strategies for abuses and illegal voting activities such as voter impersonation and intimidation. A website called Secure the Vote NC has been set up to shed light on voting irregularities in North Carolina in past elections (and hopefully prevent voting irregularities in future elections). 1. Thirty-four states have voter ID laws. North Carolina is not one of them. 2. Of the twelve Southeastern states, North Carolina is the only one that does not have voter ID laws. 3. In 2012, the Voter Integrity Project reported close to 30,000 deceased North Carolina voters to the North Carolina State Board of Elections. An illegal vote cancels out the vote of a legal voter. If you want your vote to count, you need to support voter ID laws that ensure that you are who you say you are. We also need to support laws that allow a comparison between the voter rolls and those who refused jury duty by claiming not to be American citizens. It is time to clean up our voting system. This article has two sources–Breitbart and Nevo News. Both websites are reporting that North Carolina has 2,214 voters over the age of 110. Two voters — and, yes, they’ve already voted in early voting — are over 150! One in Gaston County is 154 and another in Granville County is an astonishing 160! Many are even older than 110. In fact, it seems that NC has an awful lot of voters that are 112, too. The Carolina Transparency project did a review of the voter rolls this year and found that there are 631 Democrats who are 112 or older. By contrast, the Republicans can only find 229 over 112 voters in the state (and “unaffiliated” found 39). …This isn’t necessarily evidence of vote theft. It could be a massively failed voter registration system, although it is notable that the largest number of these voters just happen to be Democrats. But what ever is the case, it is highly unlikely to have this many centenarian voters still able to get out of their wheelchairs or retirement homes and have a run down to the polling place. Something certainly seems amiss in North Carolina. Either these people hold the world record for longevity or we have a problem with our voter rolls. This is another example of why we need voter ID. Do you really want your vote cancelled out by someone impersonating an 160-year-old voter? On Friday The New York Post posted a story about calls for the resignation of Manhattan Board of Elections Commissioner Alan Schulkin. Commissioner Schulkin made the mistake of speaking truthfully to an undercover reporter for James O’Keefe‘s Project Veritas. A guy whose job involves trying to keep elections clean vents at a party about what he sees as a threat to clean elections. How is this a firing offense? City Democrats would be wise to just laugh the whole thing off. After all, if they take away Alan Schulkin’s job now, lots of people will conclude he was punished for telling the truth. Honesty used to be an asset in an employee. I guess if you work for the City of New York it might not be. Voter fraud is a problem. There are numerous stories from various sources about dead people being registered to vote, people being told they can fill out absentee ballots for other people, etc. I was told earlier in the year about buses of union workers brought into North Carolina and given names that they were to register to vote. On election day, people claiming to be those people would vote. It was total fraud. Unfortunately, that is a problem. The Washington Examiner posted a story today about a different aspect of voter fraud. His (Donald Trump) remark came during a conversation with Art Del Cueto, national vice president of NBPC, which represents more than 18,000 border patrol agents and personnel. “Big statement, fellas,” Trump told reporters who were present for the meeting. “You’re not going to write it. That’s huge. They’re letting people pour into the country so they can go and vote. I have seen enough stories about voter registration fraud from reputable sources that nothing surprises me. Let’s institute voter ID laws and solve the problem. I have listened to statements that voter identification laws are racist, that conservatives want to suppress the vote, and that there is no voter fraud in America. None of that is true. However, there are people who genuinely believe that the above is true, and that is a problem. Voter registration groups have not always been honest. There are numerous videos on YouTube by Project Veritas and others showing how easy it is to commit voter fraud. Recently I heard a man from an organization that is working to stop voter fraud talk about bus loads of people brought into North Carolina from other states to register to vote as if they were residents. During the voting, people claiming to be those people show up at the polls and vote. Remember, a fraudulent vote cast in any election means that a legal vote may not count. It is time to be on the alert for voter fraud and to prosecute it to the full extent of the law. Now about the voter identification thing that is going on in North Carolina. In the primary election this year, a picture identification was required to vote in North Carolina. Voter turnout was actually higher than it had been in the last two primary elections. Voter identification does not in any way suppress the vote. I would also like to point out that in today’s world, a photo id is not something unusual. Admittedly, not everyone drives, but most people at some point in their lives have to cash a check, enter a federal building, or purchase certain drugs, alcohol, or cigarettes. I have a basic prescription that the drug store asks for photo identification every time I fill. When I buy some allergy medications, I have to show photo identification. Voter identification is not a burdensome requirement–it is a requirement that ensures that every legal vote counts. So where are we with the North Carolina law? The Daily Haymaker updated the story today. Governor Pat McCrory has formally requested U.S. Supreme Court Chief Justice John Roberts to stay a ruling by the Fourth Circuit and reinstate North Carolina’s Voter ID law. “Today we have asked Chief Justice John Roberts to stay the Fourth Circuit’s ruling and reinstate North Carolina’s Voter ID law,” said Governor McCrory. “This common sense law was upheld by the U.S. District Court. Our Voter ID law has been cited as a model and other states are using similar laws without challenges. A formal petition asking the Supreme Court to hear the case will follow this request for a stay. If this all works the way McCrory hopes, it will mean a lot less chaos and confusion on Election Day –two “crops” the Alinskyites and BluePrinters have been sowing in the state for four years now. Stay tuned. Just a note–I am for the suppression of all illegal votes–that’s why I support voter identification laws. These are the reasons we need voter identification laws. Just for the record, in the recent primary elections in North Carolina, the state implemented picture identification requirements to vote. There was a record turnout–voter identification in no way suppressed the vote. Voter fraud is a problem in America. As more states are becoming aware of voter fraud, they are beginning to take action against it–requiring voter identification or keeping a better watch on voter registration rolls. The Indiana-based Public Interest Legal Foundation announced that it is suing the city of Philadelphia in federal court Monday for its failure to respond to information requests regarding possible non-citizen voters. PILF filed the lawsuit Monday against the Philadelphia City Commissioners on behalf of the Virginia-based American Civil Rights Union election integrity group, according to the Washington Free Beacon. ACRU and PILF sought answers to their inquiries about Philadelphia’s surprisingly high number of registered voters in comparison with the number of citizens actually eligible to vote during elections. But when the city’s commissioners did not respond to the inquiries, PILF filed the lawsuit against them. The article explains that the lawsuit states that because the county involved has more registered voters than eligible citizens living in the county. it is possible that they are mot properly monitoring their voter registration lists. But the city of Philadelphia did not respond to PILF’s requests for updated registration data, the number of voters ineligible for various reasons, the source agencies that provided this information, the records indicating citizenship or immigration statuses, and more, the Free Beacon noted. It is much easier to commit voter fraud in a large city than a small town. Generally in a small town people know each other; in a large city, a poll worker might not know that someone had recently died and was not voting. In a national election, this is particularly relevant because one or two large cities in a state can determine who gets the electoral college votes of that state. Voter registration lists need to be purged on a regular basis to keep our elections honest. Herman Cain posted an article on his website about a recent protest march in Raleigh, North Carolina. North Carolina is in the process of implementing a requirement to show some form of valid picture identification in order to vote. In a 2011 poll, 75 percent of North Carolina supported the voter identification requirement. However, that hasn’t stopped the protests. Each year the civil rights watchdogs hold a so-called “Moral March on Raleigh.” The annual event is designed to protest any laws that Republicans may have passed during the preceding 12 months. This year’s march took place this weekend, and it focused extensively on the Voter ID regs. So, what did you need if you wanted to attend? 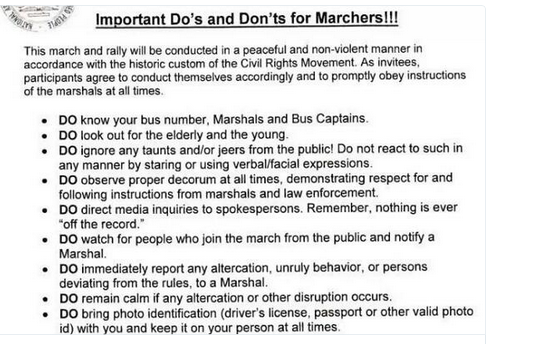 Note the last item–you have to bring a photo id to protest having to have a photo id when you vote. Makes perfect sense?!?!?!? This is an old story, but it is worth revisiting as the changes to the North Carolina voter id laws are making their way through the courts right now. In April 2014, PJ Media reported that there was massive voter fraud in North Carolina during the 2012 election. Unfortunately, voter fraud is pretty common in most states. The only real way to stop it is through requiring voter identification. Those who have gained through voter fraud are reluctant to see an identification requirement to vote. There are also some politicians who are currently proposing that we allow noncitizens to vote. So what is the penalty for committing voter fraud? Double voting is election fraud under state and federal statutes. Punishment for double voting in federal elections can include jail time. If you say that I am being unfair by accusing the Democrats of voter fraud, can you explain to me why the Democrats are the party that has opposed voter identification laws in states where voter fraud exists? The video below was posted on YouTube today. It is an undercover video done by Project Veritas. There are a couple of things to note here. The video opens with a campaign worker telling the journalist from Project Veritas that they are no longer allowed in Hillary Clinton’s Iowa offices. Okay. I suppose that is their right–it is private property. But the question immediately comes to mind, “What are they trying to hide?” The video then goes on to explain that the focus of the campaign cannot be voter registration because they only want to register voters who support Hillary. That makes sense, but it is illegal. The video explains why–Iowa election law 39A.2 (1)(b)(5), states that “A person commits the crime of election misconduct in the first degree if the person willfully … deprives, defrauds, or attempts to deprive of defraud the citizens of this state of a fair and impartially conducted election process. There is some great irony in this entire situation. States that have passed voter identification laws to combat voter fraud have been accused by Democrats of suppressing voter turnout and disenfranchising voters. Here we have a concrete example of Democratic campaign workers failing to register voters because they do not support the correct candidate. The video shows one clear example of this–the Bernie Saunders supporter was given a flyer–no one offered to register her to vote. I am not sure how common this sort of biased voter registration is, but the fact that the people who are complaining about voter suppression are doing it is hilarious. Welcome to the silly season. Get out the popcorn. North Carolina recently passed some voting laws designed to prevent voter fraud. Despite what you have heard, voter fraud is a problem in America. That is just one example. I actually think 24,000 voters in one city could make a difference in the election results. That is why I believe in voter identification. There seem to be a number of people in North Carolina protesting the new voter identification laws. Protest is their right, but one has to wonder why they would not want to be sure that only voters legally entitled to vote do so. Yesterday ABC News (Channel 11) posted a story about the protest. It seems that many of the protesters were not from North Carolina. One man interviewed was from Boston. These are paid protesters! However, the movement’s de facto leader, NAACP head Rev. William Barber says the GOP video shows no such thing. He points out that the NAACP invited anyone who wanted to support the cause to go to Winston-Salem for that voting rights rally and says he’s not at all surprised people in other states took them up on it. The protester in the video just admitted that the unions were paying the protesters. I guess the Reverend may have missed that. As far as voter suppression goes, anytime a person who is not legally entitled to vote casts a ballot in an election, he suppresses the vote of someone who is legally entitled to vote. The voter identification law will end the current voter suppression–it will not create voter suppression. The North Carolina legislature has been working on a good voter identification law for a while. They are aware of the fact that a law has to be strong enough to be effective, yet able to get through any court challenges that may ensue. I don’t understand why the Democrat Party supports voter fraud, but that is a story for another day. June 19, 2015 (RALEIGH)–After tapping several legislative sources today, we’re convinced the GOP caucus did not “intentionally” gut the voter ID law. Also, their limited window into election fraud analysis leads them to believe the new loophole won’t be a big deal in North Carolina. We humbly accept the former assertion but guardedly accept the latter. At the end of the day, their new exception will, indeed, allow anybody to walk in with one of several non-photo pieces of paper (called “HAVA IDs”) and be guaranteed a vote that counts . . . so long as they fill out the paperwork correctly. We view this as a major security breach, but Rep Lewis said South Carolina, only had 114 voters exercised this loophole. We hope the same holds true here, but we’ll prepare for the worse. Several highly placed sources convince us that it was an inside job. This emergency legislation was caused by middle- and lower-level bureaucrats at DMV who collected fees for those “free” voter ID cards and demanded more documentation than allowed by law. Whether accidental or deliberate, those state employees raised new doubts about winning the entire voter ID lawsuit and that’s what triggered the lopsided vote count. Unconfirmed report: One of DMV’s victims was a State Senator’s own mother, so they’re paying closer attention now. At any rate, we’re modifying our “tell them to veto cry” and are now urging them to investigate the sources of such harassment, . . . down to the specific employee. The notion of “progressive” moles undermining Republicans in the NC government complex is no shocker. One Rep even laughed, “they’re not used to having Republican bosses.” But jokes aside, Linda Paine, Director of California’s Election Integrity Project, even caught their DMV subverting laws against driver’s licenses for illegal aliens. So, NCDMV workers hassling applicants for their free voter ID cards is all too plausible . 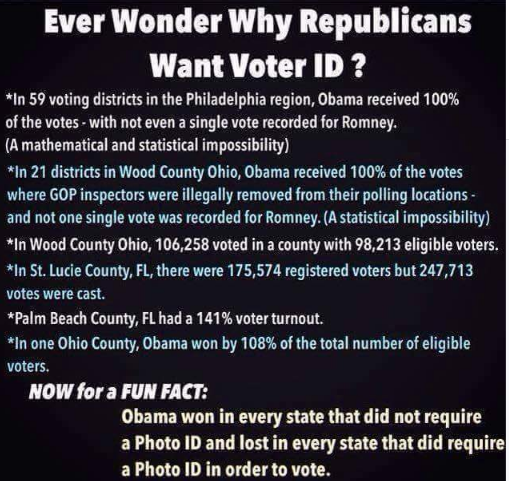 . . and very convenient for voter ID opponents! Governor McCrory and Transportation Secretary Bob Tata owe the public a full explanation. Sometimes you just have to take a first step before everything falls into place. Tonight the Coastal Carolina Taxpayers Association held a public meeting in the Stanly Hall Ballroom in New Bern to discuss the voter law recently passed in North Carolina. The speakers were Susan Myric of Civitas, Meloni Wray, Director of Craven County Elections, and Gary Clemmons, Chairman of the Craven County Board of Elections. H.B. 589, the Voter Information Verification Act (VIVA), aka the Voter Identification Bill, is the first comprehensive change to North Carolina election law in decades. H.B. 589 passed the North Carolina House of Representatives in April of 2013. In July the North Carolina Senate amended H.B. 589 and passed it. The bill then went back to the House of Representatives. The bill was ratified on July 26, and the Governor signed it on August 12. The ACLU, NAACP, and various other organizations promptly filed lawsuits against the bill, with Eric Holder later filing a suit against the State of North Carolina. The lawsuits filed are objecting to the change in early voting–from 17 days to 10 days, the end of same day voter registration, and the end of out-of-precinct voting. There will be a hearing on September 25 in Charlotte regarding the change in the voting law. Under the new law, voters must register to vote by October 10, 2014. This gives the Board of Elections the opportunity to verify the address of the voter. Under the new law, voters will be required to vote at their correct precinct based on their address as of 30 days prior to Election Day. In 2016, voters will be required to show an acceptable photo ID. In 2014 all voters will be asked if he or she has one of the acceptable ID’s for the purpose of voting. A list of acceptable photo ID will be provided for review at the polling location. Instructions will be given to voters without acceptable ID on how to obtain a no-fee photo ID from the NCDMV. The request for photo ID when voting is not unreasonable. We live in a society where photo ID is required for many activities–purchasing cigarettes or liquor, to board an airplane, to cash a check, to receive government benefits, etc. It also makes sense to have voters register to vote in time for their addresses to be verified. Hopefully, the Court will uphold this law, as it ensures that every vote counts by attempting to eliminate voter fraud. Yesterday The Daily Signal posted an article about this week’s election in Mississippi. The article wasn’t about the candidates or even about who won–it was about a part of the election that got very little publicity. Any government-issued photo identification could be used in order to vote. The State of Mississippi provided free identification to anyone who did not have identification. Contrary to the claims of those who say large numbers of Americans don’t have an ID, Mississippi estimated that only 0.8 percent of Mississippians lacked an ID. In fact, even that may have been an overestimate since the state had to issue only about 1,000 voter ID cards. All those who forgot their ID on Tuesday also could vote by an affidavit as long as they returned and showed an ID within five days. I suspect that most Americans have been involved in one or more or these transactions in their lifetime. Asking for a photo identification to vote is not any more intrusive than asking for a photo identification for any of the above activities. Hot Air posted a story today about voter identification laws in America. A Fox News poll released this week stated that 70 percent of American voters favor voter identification. Seven in 10 registered voters are in favor of identification laws in order to root out fraud at the ballot box, according to a Fox News poll released this week. The survey found majority support in every major demographic, including black voters and Democrats. The survey found majorities of every demographic support the law. Ninety-one percent of Republicans offer support, and 66 percent of independents feel the same. Fifty-five percent of Democrats support the laws, while 43 percent oppose them. Opposition to the laws is highest among black respondents, but even there a bare majority, 51 percent, support them. Forty-six percent of African Americans oppose the laws. Voter fraud impacts every voter. If you are an American citizen registered to vote, a fraudulent vote can easily cancel out your vote and rob you of the privilege of voting. Voter fraud benefits no one. Voter identification laws are one weapon against voter fraud. Rather than ‘infringing on your right to vote’ as many left-leaning politicians claim, voter identification laws protect your vote if you are voting legally. Right now, North Carolina’s voter Identification law is making its way through the courts. A well-placed source told me recently that he expected the law to stand as is without a problem–when it was passed, court challenges were anticipated. The argument of those who do not support voter identification laws has always been that there is no voter fraud. I beg to differ. PJ Media reported yesterday that there was massive voter fraud in the 2012 election in North Carolina. There is a 28-state crosscheck of voter roles that can be used to check for voter fraud. The numbers above are a result of that crosscheck. Imagine what the numbers would be if there were a 50-state crosscheck. If nothing else, these number make the case that voter identification laws are necessary if we are to preserve the integrity of the voting process. Yesterday National Review posted an article about the impact of voter ID laws on a recent election in Texas. The article quotes a a New York Times headline Thursday stating: “Texas’ Stringent Voter ID Law Makes a Dent at the Polls.” However, the facts cited in the article in the New York Times does not seem to support the headline. There are four so-called victims of the voter ID law named in the article, but all of them were given the right to vote. It does, however, note, “Officials also said there was little traffic at the offices set up by the state to provide free voter-ID documents for those without another approved form of identification.” So, in other words, the state had conscientiously prepared for the contingency of people needing voter-ID documents, and had set up offices to provide them for free. That’s a good thing, right? And what’s more, it turns out that there was really no problem after all. Contrary to the hysterical claims of those opposing voter-ID requirements, there apparently are not large numbers of Texas voters who lack identification. Texas’s secretary of state, who might know something about all this, is quoted belatedly as follows: “This was our first statewide election with a photo ID requirement in place, and it was smooth, secure and successful.” Somehow, that pithy summary was not quite up to snuff for the Times’s headline writer. Consider the things you have to show identification for. If you want to enter any government building, you have to show identification. If you want to sign up for any government program, you have to show identification. If you want to board an airplane, you have to show identification. Isn’t voting at least as important as those activities? There have been a lot of charges made lately by Democrats that Republicans want to suppress the black vote by passing voter identification laws. There is no mention of the fact that you need a driver’s license or such to enter a federal building, board a plane, case a check, etc., but that’s another story. But occasionally, when charging people with racism, inconvenient facts get in the way. Ed Morrissey at Hot Air posted a story today showing that when Georgia became the first state in the nation to enact voter identification laws, the black and Hispanic voter turnout increased. From 2006 to 2010, voting by black and Hispanic voters increased dramatically, outpacing population growth for those groups over the same period. The Atlanta Journal-Constitution also posted an article today dealing with the same subject. Under Georgia’s law, an in-person voter who arrives at the polls without a photo ID may cast a provisional ballot. The provisional ballot is counted only if the person returns with proper identification by the Friday following the election. Records show that since 2008, 2,244 provisional ballots were cast by voters lacking photo ID. Of those, 658 returned with an ID and 1,586 did not — meaning their votes did not count. That disturbs Laughlin McDonald, director of the Voting Rights Project of the American Civil Liberties Union, one of the original plaintiffs who challenged the law. “If one person is deprived of their right to see their vote count, that’s a violation of the Constitution,” McDonald said. I guess I have become a little cynical of late, but I am not thoroughly convinced that the 1,586 voters who chose not to return with identification were legal voters. Just a thought. There is no way to prove that voter fraud was stopped by voter identification laws. However, we can show that the laws do not suppress votes. In terms of stopping fraud, one blatant example of voter fraud was found in Houston, Texas, by a group called True the Vote. (See rightwinggranny.com) When True the Vote examined the voters registered by a group called Houston Votes, a voter registration group headed by Sean Caddle, who had previously worked for the Service Employees International Union (SEIU), they found that only 1,793 of the 25,000 registrations the group submitted appeared to be valid. I don’t know if 23,000 votes is enough to change the outcome of an election, but this clearly seems to be an example of voter fraud. Anyway, hooray for voter identification laws–the keep our elections honest! Fox News is reporting today that a Wisconsin appeals court has upheld a law requiring voters to show a photo ID when voting. Republican lawmakers passed voter photo ID requirements two years ago, saying the move was needed to combat election fraud. The league wasn’t the only group that challenged the law. The immigrant rights group Voces de la Frontera and the Milwaukee branch of the National Association for the Advancement of Colored People also filed a lawsuit in Dane County Circuit Court, winning a permanent injunction blocking it. That injunction still stands, although the state Justice Department has asked the 2nd District Court of Appeals to review the case. The American Civil Liberties Union and the League of United Latin American Citizens have filed separate lawsuits challenging the law in federal court. Those suits are still pending. One of the chief authors of the voter ID law, Rep. Jeff Stone, R-Greendale, began circulating a new bill last week that would let poor people opt out. That bill is aimed at allaying concerns that requirements in the original bill are too burdensome. The law requires voters to show either a state-issued ID card, valid driver’s license, U.S. passport, a student ID that expires within two years or a military ID. I am not impressed by the claim that obtaining a photo ID would be burdensome for some people. You need photo ID for a lot of things today, and a state program to provide photo ID’s for residents would actually help the residents. You can’t buy cigarettes or alcoholic beverages without an ID, you can’t get a book from the library without an ID, you can’t board a plane without an ID, and if you drive, your license is your ID. Having a photo ID is not a bad thing. On Friday Breitbart.com posted a fact-check on an Associated Press story that ran in various newspapers on July 10. The story gave examples of how voter identification requirements disenfranchise people. Then the reporter at Breitbart begins to look into the story. The Indiana law requiring identification had been in effect since 2006. Had they voted since then? It was also determined that both Weidenbeners had valid driver’s licenses and passports–either of which would have served as identification. The Weidenbeners also live within walking distance of their polling place–which means they could easily have gone home to get their identification. For whatever reason, the Weidenbeners wound up casting a provisional ballot. They then claimed they weren’t told that they needed to show an ID to officials after the election in order for their provisional ballot to be counted. But the Indiana state form that is given to all provisional voters specifically informs them that they must appear before county election officials no later than noon on the second Friday after election day either with an ID or to sign an affidavit that they are exempt from the ID requirement because they are “indigent and unable to obtain proof of identification without the payment of a fee, or that you have a religious objection to being photographed.” The AP also neglected to mention that since the Weidenbeners are over 65, they could vote by absentee ballot without an ID. It seems as if the Associated Press reporter either did not do his homework or chose to ignore the facts. Voter identification laws insure that every person’s vote counts once and that no person’s vote is cancelled out by an illegal vote. Voter identification laws do not prevent honest voters from voting–they prevent dishonest voters from voting. The Department of Justice (DOJ) has done everything it can to prevent voter identification laws from being put into effect. A recent case in Virginia (rightwinggranny.com) regarding registration of pets, children and dead people showed the need for such laws. However, the DOJ has claimed that voter identification laws will suppress the vote and prevent people from voting. I agree that people who are entitled to vote should not hindered in the process, but evidently the people opposing voter id laws are not consistent in their views. Breitbart.com posted an article today about an effort by Democratic National Committee and the Ohio Democratic Party to limit the ability of military personnel to vote in Ohio. The Democrats are attempting to strike down the part of the law that gives the military extra days to vote. In the past there have been incidents where the military were mailed their absentee ballots too late to return them in a timely fashion. In 2009 Congress enacted the Military and Overseas Voter Empowerment Act to help resolve some of the problems. Hopefully, the Department of Justice cares as much about the votes of the military as it does about the votes of people who may not have identification. This is article is based on two stories–one posted at PJ Media on Thursday and one posted in the New York Post on Friday. Both stories have to do with the Justice Department‘s (under Eric Holder) fight against verification of voter registration and voter identification laws. The story at PJ Media deals with the Texas voter ID trial which wrapped up its closing arguments in federal court in Washington on Thursday. The case is headed to the Supreme Court. The clown show saw another DOJ expert, paid thousands of dollars by you, the taxpayer, opine that vast numbers of Texans do not have photo identification. On that list were President George Bush, Senator Kay Bailey Hutchison, and Phil Gramm. These days that’s called an epic fail. But the testimony got even more ridiculous. San Antonio teenager Victoria Rodriguez travelled the whole way to Washington, D.C., for the clown show. She testified that she did not have photo ID, even though she had the birth certificate to get a free one. Her excuse? She couldn’t find the time. Neither could her parents be bothered to drive her to get the ID. One wonders if Victoria Rodriguez ever leaves the house, or when she does, if she has other priorities besides voting. I’d suspect so. One wonders how she got from Texas to Washington. If she flew, she needed a photo id to get on the plane! Yet that doesn’t mean it ought to include foreigners, felons or the deceased. But how else to interpret the Justice Department’s war on in-state efforts to tighten voter-ID requirements and prevent ballot-box fraud? Whether it’s trying to block Florida from purging its rolls of noncitizens or taking Texas to federal court over its new photo-ID requirement, Holder has signaled an unseemly coziness with potential fraud in pursuit of political advantage. Voter fraud hurts everyone equally. It undermines the principle, “One man, one vote.” It dilutes the votes of the majority and all minorities. It destroys faith in the results of our elections. It is a disgrace to have an Attorney General who not only will not fight voter fraud, but whose actions seem to actually support it.